Losing weight can be very beneficial for your long-term health if you're overweight. However, it's important to do it at a sensible pace, as very rapid weight loss can lead to serious health complications and "yo-yo" dieting in the future. A healthy and sustainable rate of fat loss is roughly 1 to 2 pounds per week. You can achieve this by creating a caloric deficit of 500 to 1,000 calories per day. Combine a healthy diet with regular exercise to lose weight without experiencing the negative health effects of overly rapid weight loss. 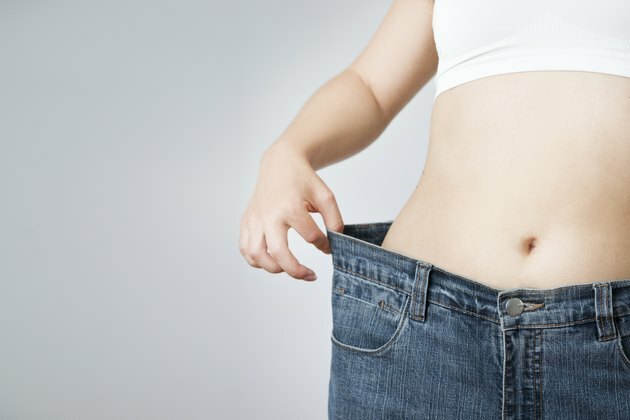 Rapid weight loss often leaves loose skin on the abdomen, arms and legs. This happens because the skin has lost some elasticity and did not have time to shrink with the rest of the body. While this may not have long-term health consequences, it can cause mental distress, as well as uncomfortable chafing. The Columbia University Health Center advises that if the skin has not contoured naturally to the body two years after the weight loss, surgery may be the only option to correct it. A common side effect of rapid weight loss is the development of gallstones -- hard deposits of cholesterol that form in the gallbladder. They can be harmless, but many people experience nausea and serious abdominal pain from gallstones, to the extent that the gallbladder may need to be removed. According to the Weight-Control Information Network, being overweight or obese makes it more likely that you will develop gallstones, so losing weight is beneficial. However, doing it very quickly actually increases your risk of developing them. When you lose weight very quickly, it's not necessarily just fat that goes. According to a study published in the journal "Appetite" in June 2012, rapid weight loss can also result in a significant reduction in fat-free mass -- lean muscle tissue and bone. This reduction in fat-free mass can lead to a slowing of the metabolism, which can cause a rebound effect when you stop restricting calories or exercising. While fatty liver disease is commonly associated with obesity, rapid weight loss is a risk factor for developing liver damage, sometimes following surgery to reduce weight in obese patients. This may be due to the sudden changes in your fatty acid profile after your weight loss, or as a residual effect of being overweight. NHS: Should You Lose Weight Fast? Should Alcohol and Caffeine Be Avoided After Gallbladder Removal? What Are the Symptoms of a Bad Liver?